Before we begin on the review proper, I must confess to being an unabashed lover of the Just So Stories, with a lovely copy sitting on my bookshelves. 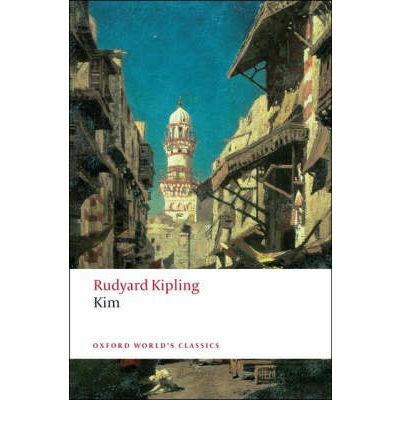 Kim is the first full length work by Kipling that I have read. Kim is a young orphan when we meet him at the start of the story. Born Kimball O’Hara, his father is an Irish soldier stationed in India and his mother a nursery maid. Both die when he is young and he is brought up by a half-caste Indian woman in the bazaar of Lahore. He is known as ‘little friend of all the world’ to those in the bazaar. He is much more a native than the Sahib he was born to be, more comfortable with the trappings and behaviours of various Indian castes and religions than he is with his own heritage. He sat, in defiance of municipal orders, astride the gun Zam-Zammah, on her brick platform opposite the old Ajaib-Gher – the Wonder House, as the natives call the Lahore Museum. They set off on an adventurous journey that takes in the vast sub-continent, it’s varying peoples and cultures and eventually leads to his induction into The Great Game through his friendship with the Pathan horse trader, Mahbub Ali. He ends up getting caught by members of his father’s regiment and is reintroduced to his Sahib roots by way of an English education at St Xavier’s, a top school in Lucknow, much to his initial disgust. There he starts his training to become a surveyor (or spy). When his formal education comes to an end he cannot wait to reunite with his lama, and he takes his first steps in to the real world of espionage with a trip into the Himalayas in search of two Russian surveyors. The ending of the novel is sufficiently vague as to his future, however. Does he continue down the espionage road, or does he take to the spiritual endeavours of the Buddhist Way? This is a rather wonderful picaresque novel that combines the story of a friendship, a coming-of-age and a bit of boy’s own romping spy fiction on the side. Kipling rolled it all together into one glorious book. I enjoyed this immensely, even with all the thees and thous throughout. Not to mention the OOS generated by flicking between the text and the references at the back of my copy of the novel. Kipling is often reviled for his views on imperialism. Personally I didn’t find this work particularly condescending or oppressively rah-rah. Instead I found it extremely evocative of British India and the variety of its peoples. It was touching, funny, beautifully written and took me right in to the life and times of a young street rascal turned spy. The characters are sympathetic and you feel that you want to follow them to their fates. Kipling clearly loved India and its people. I think it is obvious in every part of this book. If you have enjoyed any of Kipling’s short stories, then I can highly recommend Kim as your first venture into his novels. For a little more background once you have read the novel you may find this article interesting, especially with regards to the mixing of fiction and reality.